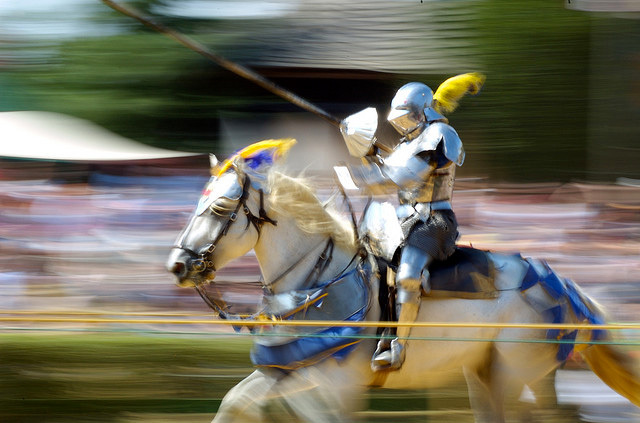 Jousting tournaments have been held in Maryland since early colonial times and became increasingly popular after the Civil War. Retaining the pageantry and customs of medieval tournaments, modern competitors are called "knights" or "maids," and many dress in colorful costumes. Men, women and children compete equally with skill and horsemanship determining the class. Jousting tournaments in Maryland are "ring tournaments" which involve charging a horse at full-gallop through an 80-yard course toward suspended rings. Using a long, fine-tipped lance, the rider has 8 seconds to complete the course and "spear" the rings, scoring points accordingly. In a jousting ring tournament, rings are hung 6 feet 9 inches above the ground from three equally-spaced arches (rings range in diameter from one-quarter inch to nearly two inches depending upon the skill-level of the contestant). 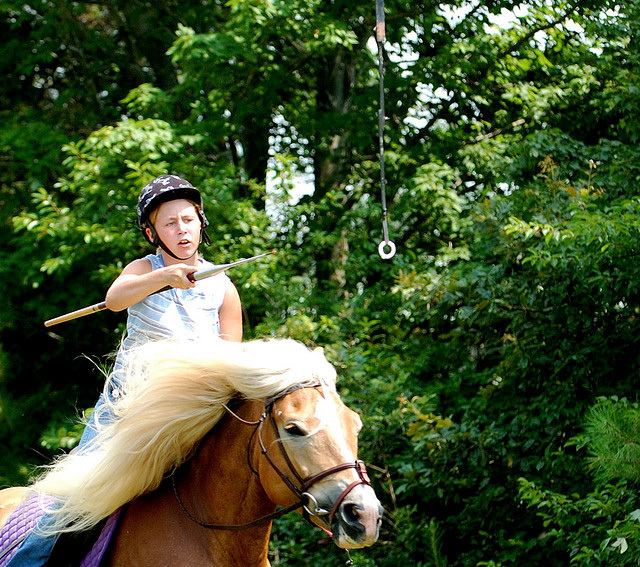 A family sport, jousting skills frequently are passed from one generation to the next. Jousting knight at Maryland renaissance festival; photo by Jeff Kubina on Flickr (use permitted with attribution / share alike).